VANCOUVER, BRITISH COLUMBIA--(Marketwire - Oct. 25, 2012) - Regulus Resources Inc. ("Regulus" or the "Company") (TSX VENTURE:REG) is pleased to announce results for an additional eight Southwest Zone drill holes from the current drilling program at the Rio Grande copper-gold-molybdenum project in Salta Province, Argentina. The key hole in this release is RGR-12-100 which tested a distinct geophysical IP/resistivity anomaly thought to represent a possible intrusive center to the southwest of previously reported high grade copper-gold mineralization in the Southwest Cu-Au sulphide zone (RGR-11-86 with 257.3 m with 0.53% Cu and 1.20 g/t Au). This hole intersected a zone of gold bearing stockwork quartz veining which represents a new style of gold-dominant mineralization at the Rio Grande Project with good potential for significant size. Key results from this hole are summarized below and in Table 1. Drill hole locations are noted in Figure 1. Contains individual 3 m long samples with up to 1.78 g/t Au and 0.44% Cu. Mineralization commences at a depth of 522.5 m but remains open laterally and upwards towards the surface. The other seven holes presented in this release were drilled to test for near-surface oxide gold mineralization in the vicinity of previously reported RGR-11-088 (104.5 m with 0.66 g/t Au from the surface). These holes encountered only a few narrow zones of lower grade oxide gold mineralization as summarized in Table 1. John Black, President and CEO of Regulus commented as follows: "The Rio Grande project continues to deliver pleasant surprises. The significant interval encountered in drill hole RGR-12-100 represents a new style of gold-dominant mineralization at Rio Grande and is associated with well-developed stockwork quartz-magnetite-pyrite-chalcopyrite veining typical of many large gold-copper porphyry systems in the Andean Cordillera. We first saw a hint of this style of mineralization near the bottom of hole RGR-12-99 and are quite pleased to see a longer and better grade intercept in RGR-12-100. This new zone is located several hundred metres to the southwest of the high-grade Southwest gold-copper sulphide zone reported in holes RGR-11-086, RGR-12-099 and RGR-12-106 and it is not yet clear if it will be a separate zone or if the two areas might be connected. The general spatial relation between the two areas of mineralization can be seen in Figure 2. The next release of drill results will focus on holes that further define the high-grade Southwest copper-gold sulphide zone laterally and to depth." The Rio Grande Project is located approximately 55 km southwest of the Taca Taca porphyry copper deposit of Lumina Copper and 11 km west of the Lindero gold deposit of Mansfield Minerals in Salta Province, northwestern Argentina. A NI 43-101 compliant resource estimate was released for the project late last year (please refer to news release of December 6th, 2011). Approximately 53% of the published resource is oxide mineralization, 35% is transitional oxide-sulphide mineralization and 12% is sulphide mineralization. The current resource estimate utilized all drilling at Rio Grande prior to 2010. The Southwest Zone was discovered in late 2011 and is not included in the current resource estimate. Further drilling in 2012 has now revealed that several mineralization styles are present in the Southwest Zone and these will be referred to as the a) Southwest copper-gold sulphide, b) Southwest supergene copper, c) Southwest oxide gold, d) Southwest molybdenum, and the newly discovered e) Southwest gold quartz stockwork zones. The approximate spatial relationship between these zones is illustrated in Figure 2 below. Twenty-six drill holes (22,802 m) have been completed to date in the ongoing 2012 Rio Grande drilling program with additional drilling currently in progress. 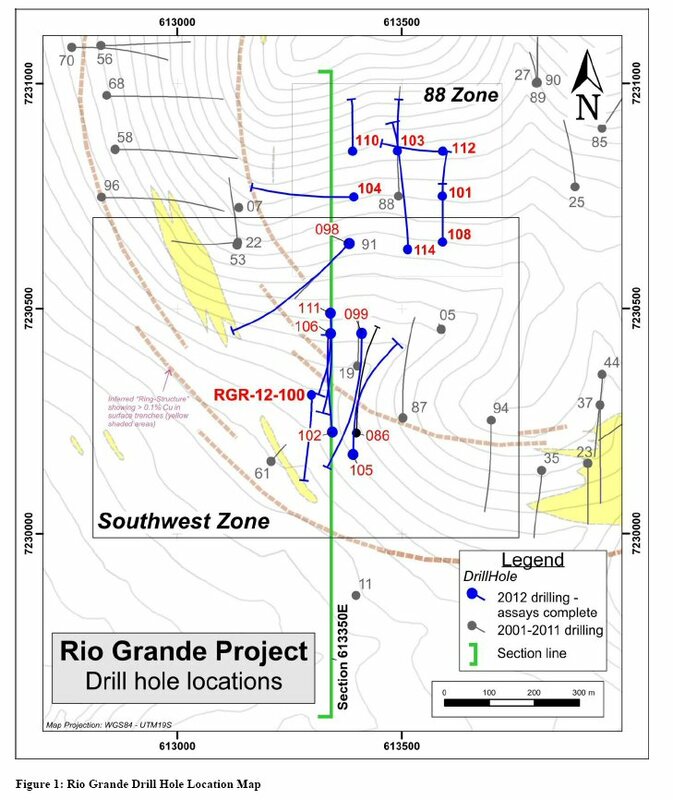 The drilling has concentrated in the immediate vicinity of the significant intercepts previously reported from drill holes RGR-11-86 and RGR-11-88 in the Southwest zone of the Rio Grande system (see Regulus news releases of December 14, 2011 and February 8, 2012). Results from the first five holes of the 2012 drilling program have been previously released (August 14 and September 20, 2012) and results from an additional eight holes are presented here. The locations of drill holes presented in this release are indicated on Figure 1. RGR-12-100, the principal hole of interest in this release, is also displayed on drill section 613,350E in Figure 2 (Please also refer to the Regulus Resources website, www.regulusresources.com for additional information about Regulus and the Rio Grande Project). Additional description of the holes presented in this release follows below. *Copper equivalent calculation uses US$2.50/lb Cu, US$1,000/Oz Au, US$18.00/Oz Ag and US$10.00/lb Mo and is not adjusted for metallurgical recoveries as these remain uncertain. The formula to calculate Cu equivalent is Cu Eq. = (Cu x 1) + (Au x 0.5833) + (Ag x 0.0105) + (Mo x 4). Intercepts are reported as down-hole intercept lengths and may not necessarily represent true widths. RGR-12-100 was collared 125 m to the northwest of RGR-11-086 and drilled in the opposite direction to test a distinct geophysical IP/resistivity anomaly thought to possibly represent an intrusive center related to the high-grade copper-gold sulphide mineralization encountered in RGR-11-086. The uppermost portion of RGR-12-100 intersected several intervals of oxide copper and/or gold mineralization typical of that found in the ring zone of the Rio Grande system (best interval contained 64.00 m with 0.31 g/t Au and 0.37% Cu). 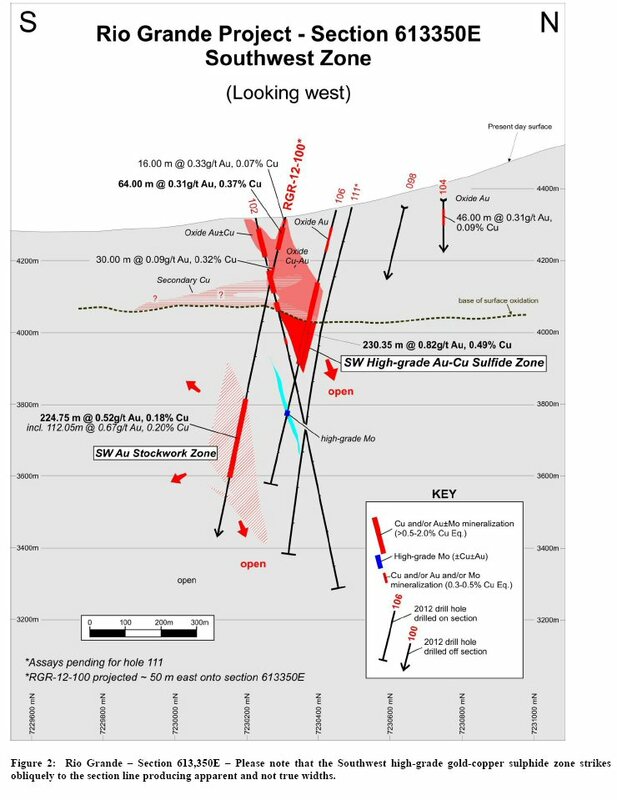 The lower portion of the hole passed well outside the southwest margins of the ring zone into weakly altered wallrock before encountering increasing pyrite contents and a zone of well-developed, sheeted to stockwork quartz veining commencing at about 500 m downhole. The stockwork quartz veining is closely associated with gold and lesser copper mineralization. Commencing at 522.50 m depth there is a 224.75 m interval with 0.52 g/t Au and 0.18% Cu. This broader zone of mineralization includes internal dilution from a 20.85 m interval of late mineral pyritic dyke that carries no gold or copper. The upper portion of the broad zone of mineralization includes 112.05 m with 0.67 g/t Au and 0.20% Cu. Individual 3.00 m long sample intervals contain up to 1.78 g/t Au and 0.44% Cu. The quartz veins form multidirectional sheeted to stockwork arrays and are typically 0.2-1.0 cm in width with occasional veins to 5 cm in width (see the photo if Figure 3 below). Veins are commonly gray and banded with a vein assemblage of quartz-magnetite-pyrite-chalcopyrite. Wallrock alteration consists of secondary biotite and potassium feldspar. This style of veining is very similar to that seen in many other large, gold-dominant porphyry gold-copper deposits in the Andean cordillera (Cerro Corona, Lobo, Cerro Casale, and the nearby Lindero deposit of Mansfield Minerals - 11 km to the southeast of Rio Grande). A distinctly later vein set contains much higher contents of pyrite and does not appear to be associated with the gold-copper mineralization. This later pyritic vein set may also be associated with later chloritic and sericitic alteration of the wallrock. The hostrock for the Southwest stockwork gold zone comprises multiple subvolcanic intermediate intrusive phases including several narrow dykes that appear to be most closely associated with the mineralization. There are also late mineral dykes that are cut by late barren pyritic veins but do not bear gold-copper mineralized quartz veining. The remaining seven drill holes presented in this release were drilled in the vicinity of drill hole RGR-11-088 to determine if near-surface oxide gold mineralization found in this hole (104.5 m with 0.66 g/t Au from the surface) had potential for a large blanket-like body. The holes were drilled on approximate 100 m centers surrounding RGR-11-088. Although all of the holes encountered very strongly altered wallrocks, they only encountered a few narrow intercepts of lower grade gold or copper-gold mineralization (see Table 1), with the better results towards the west and south, in the direction of the well-mineralized zone around drill hole RGR-11-086. Work remains to better characterize the near-surface oxide gold from hole RGR-11-088, but the potential for a large body of near-surface mineralization has been significantly reduced. Regulus Resources Inc. (TSX VENTURE:REG) is a mineral exploration company formed in December, 2010 in connection with the sale of Antares Minerals Inc. to First Quantum Minerals Ltd. Regulus has been exploring the Rio Grande Cu-Au-Ag porphyry project in Salta Province of NW Argentina as a 50/50 joint venture partner with Pachamama Resources and the two companies recently merged under the name of Regulus Resources to consolidate a 100% interest in the project and pursue an aggressive exploration program (see Regulus press releases of May 11 and May 16, 2012). All of Regulus' exploration programs and pertinent disclosure of a technical or scientific nature are prepared by, or under the direct supervision of, Wayne Hewgill, P.Geo, and Regulus' COO, who serves as the qualified person (QP) under the definitions of National Instrument 43-101. The Rio Grande samples were analysed with the following methods: Au - 30 g FA with AA Finish, Cu - four acid digestion for trace Cu and four acid digestion and AAS for ore grade Cu, 35 element Aqua Regia ICP-AES. Regulus' security, chain of custody and quality control is described on their website and can be reviewed at: http://www.regulusresources.com/BestPractices/SamplingMethodologies.aspx. Certain statements regarding Regulus, including management's assessment of future plans and operations, may constitute forward-looking statements under applicable securities laws and necessarily involve known and unknown risks and uncertainties, most of which are beyond Regulus' control. Specifically, and without limitation, all statements included in this press release that address activities, events or developments that either Regulus expects or anticipates will or may occur in the future, including management's assessment of future plans and operations and statements with respect to the completion of the anticipated drilling program and the completion of a NI 43-101 compliant resource estimate, may constitute forward-looking statements under applicable securities laws and necessarily involve known and unknown risks and uncertainties, most of which are beyond Regulus' control. These risks may cause actual financial and operating results, performance, levels of activity and achievements to differ materially from those expressed in, or implied by, such forward-looking statements. Although Regulus believes that the expectations represented in such forward-looking statements are reasonable, there can be no assurance that such expectations will prove to be correct. Such risks and uncertainties include, but are not limited to: the impact of general economic conditions in Canada and Argentina, industry conditions including changes in laws and regulations including adoption of new environmental laws and regulations, and changes in how they are interpreted and enforced, in Canada and Argentina, fluctuations in commodity prices and ability to complete operations due to factors beyond Regulus' control. Although the forward-looking statements contained in this Press Release are based upon assumptions which management believes to be reasonable, Regulus cannot assure shareholders that actual results will be consistent with these forward-looking statements. With respect to forward-looking statements contained in this press release, Regulus has made assumptions regarding: current commodity prices and royalty regimes; timing of receipt of regulatory approvals; availability of skilled labour; timing and amount of capital expenditures; future exchange rates; the impact of increasing competition; conditions in general economic and financial markets; effects of regulation by governmental agencies; royalty rates; future operating costs; and other matters. Accordingly, Regulus does not give any assurance nor make any representations or warranty that the expectations conveyed by the forward-looking statements will prove to be correct and actual results may differ materially from those anticipated in the forward-looking statements. Regulus does not undertake any obligation to publicly update or revise any forward-looking statements other than required by applicable securities law.